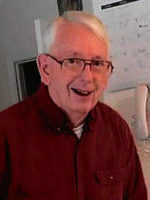 Ron passed away Friday, February 1, 2019 at the Wings Home in Allegan. He was born February 16, 1942 in Kalamazoo. Ron started worked at Harding’s Market in 1960 as an apprentice meat cutter and had been the meat department manager for many years. He had spent some time in Montana and built log homes for the KOA Campgrounds. Ron was a skilled woodworker he never came across a piece of wood he didn’t like. He was a great father and business partner operating McNees Builders for over 25 years with his son, Troy. He loved helping others and in his spare time he liked feeding and watching the birds, eating sweets and listening to music. Ron was an animal lover, especially black cats and had taken in many strays over the years. In 1962 at the Otsego United Methodist Church he married Sandra Plotts who survives. Also surviving are his children, Troy (Lisa Watkin) McNees of Plainwell and Kimberly (Tom) Minder of Nevada and granddaughter, Michelle Minder. He was preceded in death by his father, Howard McNees; brother, Terry McNees and his grandmother. Contributions in memory of Ron may be made to Wings Home of Allegan, the Alzheimer’s Association or plant a tree in Ron’s memory. My prayers are with you Sandy and all of your family. Heaven got another angel . Sandy, So sorry for your loss. Our prayers for peace and some rest for you during this stressful time. So sorry to hear of Ron’s passing. Sending our condolences, thoughts and prayers to you Sandy, Troy and Kim. My heartfelt condolence to the family and relatives of Ron McNees. My thoughts and prayers for the eternal repose of Ron. May he rest in peace in the bosom of our Almighty FAther in heaven. Amen. May GOD BLESSINGS be with Ron’s family during this time of grievance. Remember all the great times you shared with each other. Not very good at this stuff but, will say prayers for you and your family. We would come down if we were able. Love ya. With deepest sympathy as you remember Ron. Our thoughts are with you and your family. may he Rest In Peace. My thoughts and prayers are with you during this difficult time. Reflect on the good times and the wonderful memories to comfort you during this time.